Uh oh, looks like Olive fell down and hurt herself! And now she looks … angry. You know, we’ve been having plenty of fun here watching Mary sexually reject dudes, but we shouldn’t lose sight of what this Olive story is really about, namely a little girl who talks to angels and can see the future. If there’s one thing movies have taught us about creepy children with mind powers, it’s this: they seem cheerful enough until they encounter a difficulty or obstacle that a normal person would take in stride, and then they get very angry indeed, generally with terrible consequences. The population of Midtown Manhattan seems to have dodged a bullet this time, though. Dude with the mustache is panel one in lucky his head didn’t explode, splattering goo everywhere, as a side effect of Olive’s rage. 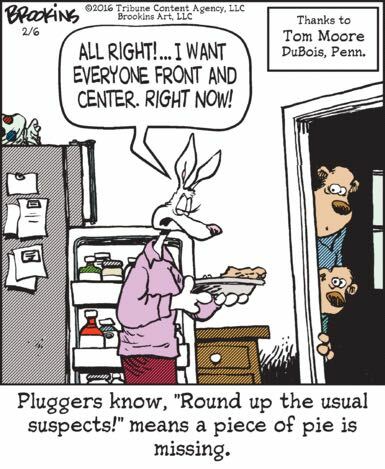 Pluggers know that, no matter what you say about the Nazis and the regimes that collaborated with them, they sure knew how to maintain law and order.